Getting a puppy is an exciting time but also an experience you’ll want to get right. 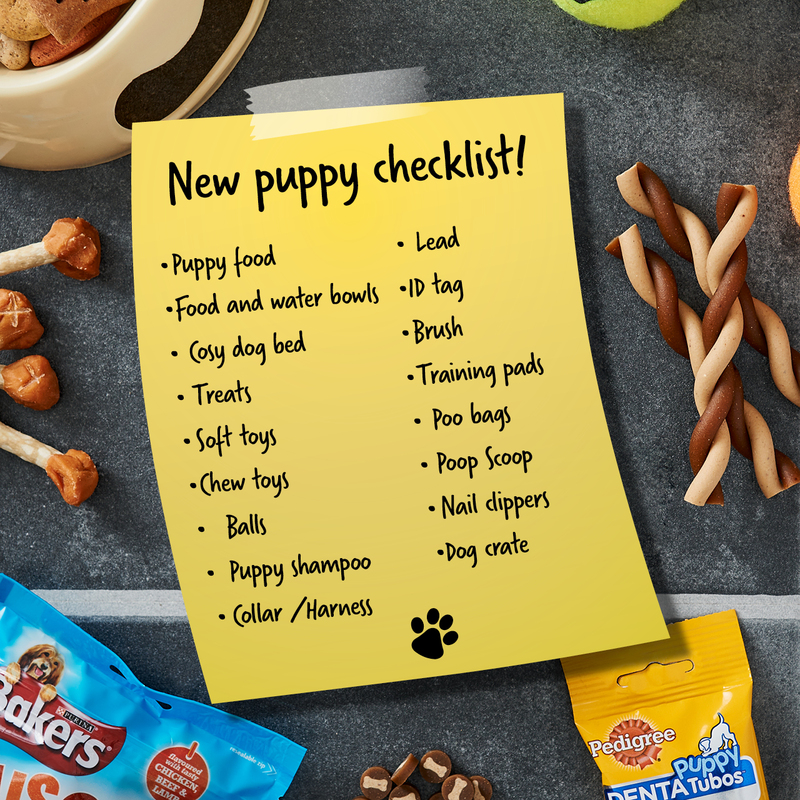 From choosing the right food to teaching your puppy the ropes with toys and treats, our puppy guide will help you get your new pooch happy and settled at home in no time! There are a few important things you should do to prepare for your new puppy. Firstly, make sure that the previous owner has taken care of your puppy’s first vaccinations and started their toilet training. You’ll also need to spend some time looking into pet insurance and find a local vet too. Give the house a good once-over to make sure there’s nothing dangerous your puppy could chew through or get hold of. 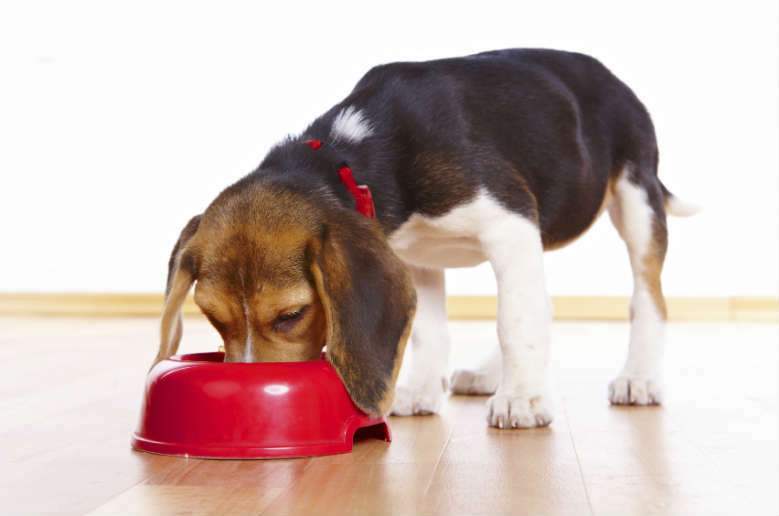 Puppy food – The best thing to do when your new puppy comes home is to feed them the same puppy food they’re used to for a few days so that they feel welcome and secure. Then it’s up to you what you choose to give them; but start by mixing this in with the old food they’re used to and bit by bit over the next week switch it to their new food. Food and water bowls – Try to pick a food and water bowl with a heavy bottom, that way they’re less likely to knock them over by accident! If your new puppy has long ears, it’s a good idea to get them a special narrow bowl so they don’t dangle their ears in their food and water. Dog bed – Puppies love to sleep and yours will need somewhere cosy to snuggle up in when they’re tired. Choose a comfy pet bed and place it away from any draughts. You might also want to invest in a dog crate to keep them safe and out of trouble at night time. Identification tag – Did you know it’s the law for all dogs to wear a tag which shows their owner’s name and address? Collars can sometimes slip off, so why not have your puppy microchipped too? That way if your puppy decides to go wandering you’re more likely to be re-united. Toys and treats – We all know dogs love chewing and will chew anything they can get hold of (dad’s slippers, the chair leg maybe!). Try and keep your valuables safe by getting your puppy a selection of tasty treats they can sink their teeth into instead. And don’t forget the puppy toys to keep them entertained too. We’ve got everything from rings to balls to rope; all great for making those training times fun for both of you! Grooming supplies – For your puppy, grooming isn’t just about untangling their coat and making them look smart, it’s also something they do to remind them of their mum. Get them a comb or brush and keep them looking ship shape as often as possible (every day is ideal). And don’t forget the nail clippers and dog shampoo too! Collar and lead – Before taking your new puppy for walkies, make sure they’ve had all the right jabs. In the meantime, get them used to their new collar so they don’t complain when you’re finally out and about with them! You can get collars and leads in lots of different materials. It’s best to go for something made of nylon or soft leather that’s adjustable as these can then grow with your puppy (just make sure you check the fit regularly as you’ll be amazed at how fast they grow!). This first night with a puppy is the most important as you get to know each other. The behaviours and experiences your puppy learns in their first 12 weeks with you will more than likely shape how they interact with you and others in the future. Get them used to things they’ll experience every day including carrying them outside to see the sights and sounds, meeting other healthy dogs, grooming and getting in your car. You can also start to leave your puppy at home for short periods of time and get them into a consistent routine so they can feel stable. Keep feeding them the same puppy food they’re used to and don’t forget to continue with the toilet training (our puppy training pads will help with any nasty accidents while you persevere with this). Try and keep your puppy away from any stairs, balconies or ponds. Puppies can be really nosy when they arrive in your new home so invest in a baby gate to keep them away from these dangerous places when you’re not around. From 12 weeks, your puppy should be fully vaccinated, after which you can start to take them outside and turn them into a true socialite! Boost their confidence and help give them basic training with puppy classes. You’ll find that their favourite toy or treat will also help things along! Keep them healthy with advice from your vet around worming and flea treatments. Once you’ve reached the six month milestone you’ll be pleased to know that the hardest months should be over! Continue to consistently train your puppy and build on their positive experiences as they grow into a confident adult dog. As their dietary needs start to change, gradually move them to adult dog food. Armed with these basic guidelines and lots of love and attention, your dog is sure to grow up to be happy, confident and the perfect companion!